About 20 years ago, at the start of my medical career, I went from being a healthy, thriving physician to becoming a disoriented and terrified version of myself. I woke up feeling like I didn’t even know who I was anymore. I was depressed, anxious, forgetful. It got so bad that I had a hard time following what my patients were saying during their appointments. I tried to take careful notes and keep track, but I couldn’t focus on our conversations. I couldn’t even remember anyone’s name. Some doctors, including my colleagues, said that I was depressed and recommended taking anti-depressants. I saw a few psychiatrists who suggested anti-anxiety medication. My family doctor prescribed me sleeping medication, and a neurologist told me that I had ADD and needed stimulants. Other doctors told me that I had chronic fatigue and fibromyalgia. At that point, I was exhausted and I needed answers. All that I knew for sure was that my brain was broken. I was depressed, my memory was failing me, and my body just wasn’t working the way it used to. These doctors had good intentions, but all of the recommendations for another pill did not sit well with me. So, I decided to go on my own journey to heal my broken brain. It was at this time that I discovered the power of Functional Medicine and the idea that every system in our body is connected — everything we eat, do, say, think, and how we live can influence all aspects of our health, including that of our brain. That was a revolutionary moment for me. It was the moment that I realized my brain disorder was not localized in my brain; maybe the root cause was in the rest of my body. Treating my own brain disorder led to me to the world of Functional Medicine. Although suffering from anxiety, depression, ADHD, and brain fog was difficult to say the least, I truly believe that I went through this experience to discover a revolutionary approach to treating chronic disease. Functional Medicine has helped thousands of my patients and the patients of other practitioners recover from a broken brain. Now, I want to help you identify some of the root causes for brain disorders and how we can recover from them. This is why for the past year, my team and I have been working on an 8-part docuseries about brain health called the Broken Brain Docuseries. Our broken brains cause many problems such as anxiety, depression, bipolar disease, personality disorders, addictions, obsessive compulsive disorder, attention deficit disorder, autism, Asperger’s, learning difficulties, and dyslexia. A broken brain also includes psychotic disorders such as schizophrenia or mania and all the neurodegenerative diseases of aging, especially Alzheimer’s, dementia, and Parkinson’s disease. There are also brain problems that fall on the lighter side of the broken brain continuum. These are challenges that many psychiatrists and neurologists might brush aside, but they are the most common complaints that I hear about in my office. These problems include chronic stress, lack of focus, poor concentration, brain fog, anger, mood swings, sleep problems, or just feeling a bit anxious or depressed most of the time. These are all treatable. Look around, maybe you know someone with a broken brain. Maybe it’s even you. Psychiatric disorders affect 26 percent of our adult population or over 60 million Americans? Over 40 million people have anxiety? Over 20 million people have depression? One in ten Americans takes an anti-depressant? The use of antidepressants has tripled in the last decade? Alzheimer’s disease will affect 30 percent (and some experts say 50 percent) of people over 85 years old? Yes, these statistics are grim. What Leads to a Broken Brain? You might not know that too much sugar and refined carbs, not enough good fats, inadequate intake of the right nutrients, and exposure to toxins can create a brain disorder. So can inadequate sleep, stress, lack of exercise, and overuse of drugs and alcohol. My own brain challenges started with mercury toxicity. I became toxic because I polluted myself by growing up on tuna fish sandwiches and eating sushi. I also lived in Beijing, which heats all its homes with coal – the major source of environmental mercury – plus I had a mouthful of amalgam fillings. All of these exposures, combined with genes that prevent me from effectively detoxifying metals in my body, led to a slow and significant poisoning of my cells and mitochondria. Because of this I felt weak, tired, and couldn’t think. I had muscle pain and twitches, insomnia, digestive problems, food allergies, depression, and anxiety, and it was only by discovering high levels of mercury in my hair and urine and slowly detoxifying myself that I was able to get better. Now this was just my experience. A broken brain could be the result of nutritional deficiencies, a leaky gut, a chronic infection, and much, much more. It could be just one of these things or a combination of them, and the truth is that though medications can help, they just cover up the symptoms and sometimes only temporarily. Until you get to the root cause of your broken brain, you will not be able to truly heal. Our brains are our most prized organ, and having optimal brain health is absolutely critical in order to live and thrive in our modern society. Unfortunately, most of us are living with semi to low functioning brains. This is why I brought together over 50 experts to talk about this epidemic and how we can take steps toward a better brain. In this docuseries, you’ll learn the seven steps to creating what I call an ultramind. We’ll talk about how our guts, stress levels, toxins, relationships, diets, and much more influence the health of our brains, and we’ll present a six week plan to start taking back your brain health today. 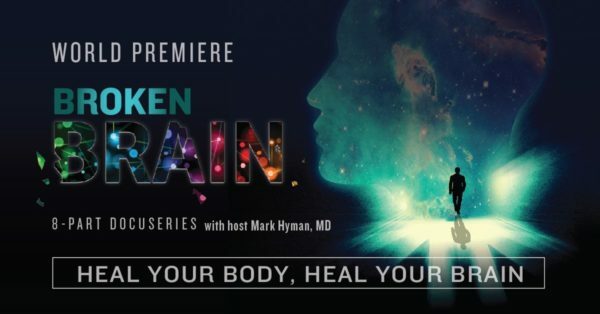 I promise you, that if you watch this free series you’ll walk away with a much better and deeper understanding of our most precious and dynamic organ – the brain! Throughout this month and next month, you’ll receive more information about this free docuseries, so be sure to stay tuned. You don’t have to suffer with a broken brain anymore. Let’s fix this problem together. Join our movement by signing up for this free series and spread the word to your friends so we can all take back control of our brain health together. If you have questions about the brain, tweet me and use the hashtag #housecallwithdrhyman. Maybe next week I’ll make a house call to you. *This article originally appeared here.